Pumpkin carving contests are a fun way to win money, fame, and prizes every fall. Many local communities hold them, and there are often online contests offered as well. If you'd like to sharpen your pumpkin carving skills and get the winning edge this Halloween, read these tips. The very first step in winning pumpkin carving contests is to read the rules. Before you think about what kind of pumpkin carving you'd like to do, check the rules to find out whether there are any restrictions on pumpkin size, theme, or how to enter. It's also a good idea to find out what the judges are looking for when they review the entries. Most contests will list their judging criteria. Tailoring your entry to fit these criteria can give you a big boost over the competition. Why should you come up with your pattern before you even look for your pumpkin? So that you can be sure to pick out the pumpkin that suits your design. Some carving ideas look best with a tall, narrow pumpkin, others cry out for a fat, round one or one with a nearly flat face. By looking carefully, you can pick the pumpkin to make your carving shine. Now that you have your pumpkin, it's time to get ready to carve it. Start by washing and drying it to remove dirt and debris. Then look for the perfect side of the pumpkin to carve. Finally, trace your pattern onto the pumpkin using a marker or a pencil. The advantage of a marker is that you can see your tracing better. On the other hand, the pencil is less likely to distract from your image if any of it is left on the pumpkin after you're done. An ice cream scoop or a large, sturdy spoon for removing the seeds. A large, sharp knife for the rough carving work, like cutting off the lid of the pumpkin. Smaller, sharp knives for detail carving. A boning knife, a paring knife, or a keyhole saw are good choices. 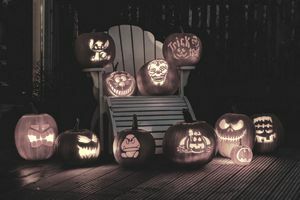 If you want to take your pumpkin carving to the next level, check out this list of professional pumpkin-carving tools from SheSaid. First, cut a large hole in the pumpkin. Remember that there are more options than simply cutting around the stem available to you. Your design might be better served by a hole in the bottom of the pumpkin, or in the back. Wherever you make your opening, be sure to angle your knife slightly inwards toward the stem so that the lid won't fall through the pumpkin when you replace it. It's also a good idea to cut a notch into the opening so that you can easily see which way the lid should be replaced. After you've cut out the lid, scoop out the pulp and seeds with your ice cream scoop or spoon. Remember that the more pulp you remove, the more light will shine through the jack-o-lantern's shell, making your pumpkin more luminescent. This could make a better picture for your contest entry. Once your pumpkin has been cleaned, you can use your smaller knives or keyhole saw to cut out the pattern you've traced onto your pumpkin. Remember to cut on the outside of your lines, and be very careful with small pieces. You don't want your pumpkin to rot before it has the chance to be judged, do you? After you are done with your carving, take the additional step of submerging your pumpkin in a mixture of three gallons of water to a teaspoon of bleach. This will help kill any bacteria on the gourd's surface, slowing down decay. Let the pumpkin air-dry thoroughly. When you're done, rub cooking oil on all exposed edges to prevent browning. So you've carved a perfect pumpkin, but you're not quite done yet. Many pumpkin carving contests will ask you to send in a picture of your carving, and it's important to get just the right picture to wow the judges. Try to shoot your photo on the same level as your pumpkin. Taking a picture while you're standing above will skew how your carving looks. Pay close attention to the background of your carving. Use a solid backdrop, or pick something appropriate like an old door, a hay bale, or a fence to form the background. Make your pumpkin look as large as possible. Let your pumpkin fill the frame so that the judges can enjoy your details. Get the lighting right. Some jack-o-lanterns will look best lit up at night. Others call for a dramatically cloudy daytime sky or even full sunshine. Experiment to see what looks best for you. MacWorld has some good tips on how to photograph your carved pumpkin. Don't Throw Away the Pumpkin Seeds! Pumpkin seeds are delicious ​when they are toasted, and good for you as well, so don't throw them away while you're carving. If you're not sure what to do with them, here are 12 things to do with pumpkin seeds from TheKichn. Kids love carving pumpkins, but you need to be careful to be age-appropriate with the sharp implements. Younger children can have fun scooping out seeds and tracing stencils. If the contest's rules allow, you can also choose a no-carve entry to work on together with your children. Want to Win Recipe Contests? Read These Tips! What Do Essay Contests Consider Part of Their Character Count?